Research shows that exercise is safe during cancer treatment and can combat common cancer-related side effects such as cancer-related fatigue, unwanted weight changes, low energy levels, and loss of strength. Physical activity can also play an important role in the prevention of recurrence of cancer in survivors. The American Cancer Society Guidelines recommend cancer patients and survivors aim for at least 150 minutes of moderate activity per week and strength training exercises 2 times a week. 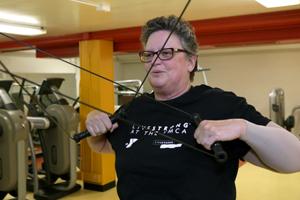 The Cancer Well-fit™ Exercise Program at the Santa Barbara Athletic Club is designed for anyone who has been diagnosed with cancer in the past nine months and needs a boost getting back into shape. This 10 week program enables individuals to regain muscle mass and strength, improve endurance and increase flexibility. Participants will work with trainers in a small group setting to develop a personalized fitness routine. For information or to register, please contact Paula Lilly at (805) 966-6147 ext. 262. The Cancer Center offers two yoga classes. Yoga for Strength and Empowerment is focused on relieving muscle tension, increasing flexibility and total body conditioning. Gentle Therapeutic Yoga for Health & Healing is a restorative, relaxing practice that features a flowing sequence of supported yoga postures, breathwork, and guided imagery. Both classes are appropriate for all levels; no prior yoga experience is needed. Also helpful for long-time practitioners who are looking to modify their practice.